Anxiety is the fastest growing problem in the US today. More and more children are presenting with problems that show up in physical symptoms and behavioral problems at home and school. Anxiety is defined as excessive worry over a variety of topics with three or more accompanying symptoms such as tiredness, trouble sleeping, panic attacks, restlessness, irritability, difficulty concentrating and muscle aches. The presence of anxiety can lead to other medical problems such as abdominal pain, diarrhea, headaches or chronic nausea. The better you understand what is happening your child’s body, the better you can help him or her heal from fears and anxiety. A child can be triggered just by thinking of giving a presentation at school, getting their homework right, seeing someone get sick or go to the hospital, reading about a disease, imagining monsters in their room, or seeing a bug crawl across their bedroom floor. Children are naturally creative and imaginative but this can become out of control thinking that results in fearful reactions. 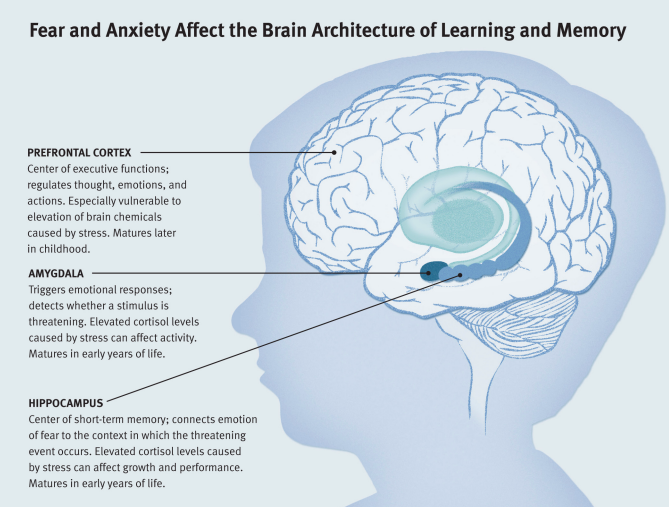 When children are triggered by a fearful or traumatic event, the brain and body will respond in a way to protect them from further hurt or harm. Even if this trigger is just imagined, it will have the same effect as if they are actually in a real, terrifying situation. The brain is giving the child a false signal that isn’t real or necessary. This signal comes from the emotional, mid-brain of the child in what is called a “fight or flight” response. The result is the emotional brain hijacking the thinking brain (the area in the front of the brain called the Prefrontal Cortex). This is very helpful if we are really in danger. It is not helpful if we are not. In order to deal with this emotional hijacking, parents must help children desensitize to stressful triggers. This is done through systematic exposure therapy, rational thinking, and bodily relaxation tools. We will explore many of these tools in this course. For additional help, it is recommended that you find a child therapist that specializes in anxiety disorders in children. Get more tools to help you and your child with anxiety, worry, fear, and panic at FamilyHealer.tv. The courses are free and you can get power-full tools for increased peace and joy today! Anxiety is the #1 mental health problem in American society. A startling one in eight people describe experiences, every week, that would qualify as a clinical diagnosis of anxiety or panic. Fortunately, it is also one of the easiest to manage if you know how! Anxiety is a normal human emotion that everyone experiences at times. Many people feel anxious, or nervous when faced with a problem at work, before taking a test or making an important decision. Anxiety disorders, however, are different. They can cause such distress that it interferes with a person’s ability to lead a normal life. An anxiety disorder is a serious mental illness. For people with anxiety disorders, worry and fear are constant and overwhelming and can be crippling. Pause and Breathe. Take several occasions throughout your day to “pause and breathe.” Set your alarm for every couple of hours to take a couple of minutes to put everything down and take 10 good inhale and exhale breaths. Notice what is happening inside of you and around you but don’t have any judgments about it or need to take any actions. Simply notice and take another breathe. It’s OK if your awareness shifts frequently. Just go back to your slow, deep breathing. Detect and Redirect. Play detective by cluing into what you are thinking or saying to yourself when you feel anxious. Again, don’t judge it as good or bad but take note (literally write it down) of what preceded your anxious feelings. Begin to be aware of triggers in the form of situations and socialization that make you feel anxious. Redirect yourself physically to disconnect that trigger from your life. Learn to move to another room or avoid negative conversations or take another course of action that might not lead you into an anxious state. Have a “hot list” of the 5 most anxious producing situations or thoughts to avoid. Challenge these anxious thoughts by asking how much of it is really true? One hundred percent of the time true or 50% or 10% or 1%. Even if it is true 90% of the time, what is different about the 10% that isn’t? Positive Declarations. Once you have a “hot list” of anxious thoughts, start doing or thinking the opposite. Make a list of positive declarations that start with: I am… I will… I can… Today, I have… I choose… I live… My life is… I know… I take back… It can be hard, at first, to come up with a list of positive statements so enlist the help of others. They will be much more objective. Say them out loud even it if feels awkward as your own voice can be self-empowering. The more you say them the more believable they will become and the more present in your life. Use these declarations whenever the anxious thoughts start up in your head. Yell them if necessary! Are you ready to be free of anxiety, fear, worry, and panic? Take Ron Huxley’s FREE online course: Freedom From Anxiety. Just click here now! The TriUnity Model of my online course “Freedom From Anxiety” refers to the three domains of our nature: Body, Mind, and Spirit. This faith-based approach to dealing with fear, worry, panic, and anxiety operate by focusing on our identity and destiny. In the Bible, a favorite verse is Psalms 139 that declares, at the moment of conception, we were wonderfully and fearfully made. This original design struggles to present itself in a world full of brokenness and pain. Restoring this divine order is the central aim of the “Freedom From Anxiety” course. To achieve this, the course addresses anxiety in the body by creating safety, turning off the false alarms, building NeuroResilience* to repair the limbic system and balance in the autonomic nervous system. It focuses on anxiety in the mind by capturing negative thoughts that lead to anxious feelings and behaviors. And finally, it concentrates on the spirit that rediscovers our true self and integrates disconnected aspects of the body and mind. Another favorite verse is “For God hath not given us the spirit of fear; but of power, and of love, and of a sound mind” (2 Timothy 1:7, NKJB). This sound mind refers to the capacity to bounce back from traumatic events that are the root of much of our anxiety and fears. Having the correct alignment between body, mind, and spirit, allow us to build this capacity to have self-control and positive self-judgments in the face of anxious moments. A positive, God-centered identity allows us to have “ease” in life, living confidently and courageously. When we do not have “ease” we have “dis-ease” that affects every area of our nature. Having a higher perspective of yourself, in the world, brings a greater sense of peace. 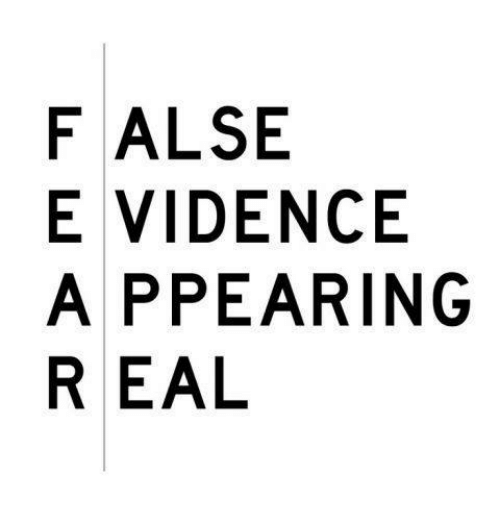 Viewing things from our bodily reactions and our mental experiences give rise to fear and terror. The world can be a scary place. Life can be overwhelming. One definition of trauma is when stressors overwhelm our capacity to manage them. Building spiritual capacity is key to our new freedom. Learn more about how you can find “Freedom From Anxiety” by taking our free course at http://FamilyHealerSchool.com now. Children’s Fears: Create a S.A.F.E.R. H.O.M.E. A Healthy Gut is a Happy Gut! SPECIAL OFFER: Our Freedom From Anxiety program is now available as a monthly membership program. Get new tools for the body/mind/spirit and overcome anxiety for only $29.95 per month. Don’t miss this unique offer…click here for more info! I really can’t think of anyone who loves stress. Do you? A little stress is normal in life but it can range from positive, tolerable, or even toxic. When we suffer from toxic stress early in life it can effect how our genes express their programmed ability to manage it. A new book on the subject of stress, called “Born Anxious: The Lifelong Impact of Early Life Adversity – and How to Break the Cycle , by Daniel P. Keating” reveals how and what happens when we are impacted by toxic stress. The book discusses research on epigenetics which is the study of genetic expression and how it is altered by environmental events. Our genes are designed, by our DNA, to cope with certain levels of stress. Positive and tolerable stress can be managed by our stress programs. Toxic stress, experienced early in life, effects if our genetic programs actually get turned on or off. Our bodies are designed to amp up or power down in reaction to the type and amount of stress we go through on a daily basis. For example, if we find ourselves facing an angry dog, our immediate reaction is to fight or flee in order to survive. If the dog runs off, we might continue to feel agitated for a short while after the encounter and then we will naturally calm back down. Our nervous system is designed to amp up to deal with the dog and then reset itself so that we can function normally again. Some of the reasons for early life stress can come from internal sources, such as hunger, pain, illness, fatigue, and external sources, such as family conflict, divorce, poverty and natural disasters. Many children suffer from the toxic stress of prenatal substance exposure and parental neglect. This formative time can have prolonged effects on our feelings of safety and our genetic expressions of coping. Learn healing principles for lasting change. Discover practical tools to master fear, panic, and worry instead of it mastering you. Click here to get the report in your inbox immediately! Is your child a warrior, or a worrier? That cute — and memorable — phrasing comes from “Why Can Some Kids Handle Pressure While Others Fall Apart?” by Po Bronson and Ashley Merryman (famous for “Nurture Shock” and now the authors of “Top Dog: The Science of Winning and Losing”) in The Times Magazine. It’s shorthand for a problem most of us are familiar with: some people seem born to take tests or compete. For others, the whisper of pressure can trigger the seeming disappearance of everything we ever learned. But while understanding the causes may help promote eventual changes in standardized testing, there’s no way to entirely avoid the need to perform under pressure — and no way to avoid it on behalf of our children. For the parents of worriers, one question hovers over the topic: how can we help our children learn to both perform better, and feel that stress just a little less? I asked the magazine piece’s authors to help me pull out what they learned in researching their article, and to share some other ideas and background that might help. Embrace the anxiety. Students who read a statement declaring that recent research suggests “people who feel anxious during a test might actually do better” did, in fact, do better on tests, in the lab and outside. Find competition that’s fun. Spelling bees, chess teams, sports, science fairs: when the pressure is predictable and comes with friends and excitement, even worriers build up their tolerance for the stress that doesn’t include those benefits (like the SAT exams). These competitions “give kids the chance to make that connection between feeling a little anxious and performing at their best,” Mr. Bronson said. Watch for when “stress” turns into “distress.” For many children, short-term stress can be energizing. But when it goes beyond the short term into a larger problem, “parents need to try to find the triggers that change test taking from a challenge state to a threat state.” The child who lost sleep for a month over standardized testing (described in the article) had heard from teachers that school funding and teacher pay is partly tied to these tests now, so he felt an enormous burden to score super high on the standardized tests, to help buoy the school’s averages. Get more PARENTING TOOLS by clicking the “Freebies” link at the top of the page!